Soft and sweet cinnamon apples combined with a crispy oat topping make this Oaty Apple Crumble a comforting and warming dessert that the whole family will love and it’s lighter than most desserts too! 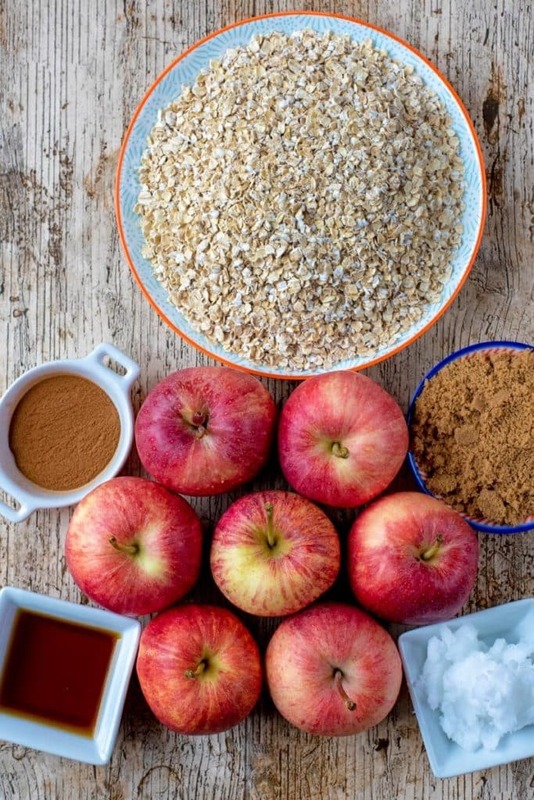 Forget traditional crumble topping – this oaty toppings has a lovely crunch to it and makes it a Healthy Apple Crumble. Deliciously sweet apples mixed with some cinnamon and topped with a crispy oat topping. 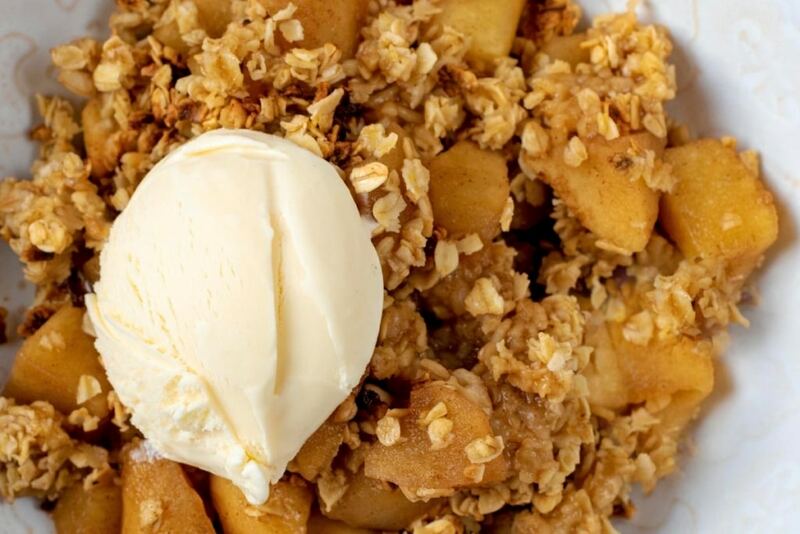 This is our twist on a traditional apple crumble and we actually prefer it this way now. The perfect comforting dessert on a cool day. Whilst we used apples, you could swap them for pears, or use a mixture of both. This is a hearty and comforting dessert, that doesn’t over-do it on calories and fat either. We are all about the desserts at the moment, and finding ways to make them lighter so they can be more of an every day thing, rather than a once in a while thing. We have used a little bit of brown sugar and maple syrup to give it some extra sweetness, but not as much as you would usually find in an apple crumble. Apples are so good this time of year, that we wanted to let the natural sweetness shine through. 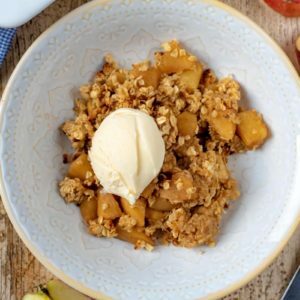 Just 6 ingredients go in to making this healthy apple crumble, so you can be sure exactly what has gone in to it, compared to buying it in store. Traditionally a crumble topping is made with butter, sugar and flour. But we have changed things up and used some coconut oil, maple syrup and oats. I really like using oats instead of flour, as it gives the crumble much more texture and I think it is nicer to look at too. Plus, an oat and apple combination is basically breakfast, and who doesn’t want crumble for breakfast! You can top this oaty crumble with some custard, ice cream or Greek yoghurt, or just leave it as it is. I personally think that this could be considered a breakfast item, as it’s oats and fruit. That is what we are telling ourselves anyway. We topped ours with some vanilla frozen yoghurt as a bit more of an indulgent dessert. Can You Make it in Advance? Yes, you can make the apples and topping in advance, layer it in your baking dish and then just put it in the oven to crisp up before you are ready to serve it. We hardly ever have any leftovers of this, as we can happily eat double portions. But if so, it will keep in the fridge for a couple of days. You could freeze it in containers, but the oats would go a little soggy once defrosted. One: Mix together the oats, maple syrup and 2 tbsp of coconut oil. Two: Add one tbsp of coconut oil to a pan and melt. Add the apples and gently cook for 5 minutes until softened. Put the sugar and cinnamon in the pan, stir and cook for a further 2 minutes. Put the cooked apples in a baking dish. Three: Top with the oat mix. Four: Put in a preheated oven at 200°C/400°F for 20 minutes. Serve with either custard, yoghurt, ice cream or frozen yoghurt. You can also make this in the microwave – head over to our Instagram Page to see how. You could swap the apples for pears, or use a mixture of them both to make this crumble. Add some ginger and nutmeg for some extra seasonal flavours. 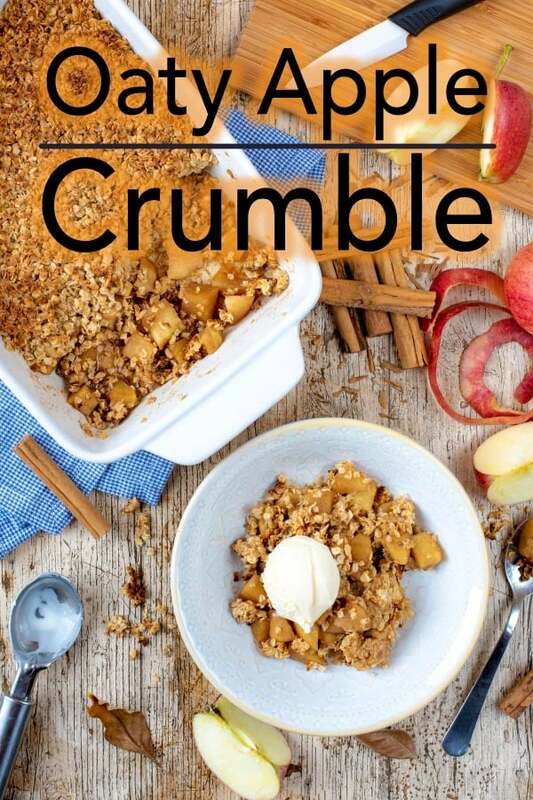 Do you want to be kept up to date on more delicious posts like this healthy apple crumble? Please subscribe to the blog mailing list (it takes 30 seconds). If you’ve tried this Oaty Crumble, or any other recipe on the blog, then let us know how you got on in the comments below, we love hearing from you! You can also FOLLOW US on FACEBOOK, TWITTER, INSTAGRAM and PINTEREST to see more delicious recipe ideas, behind the scenes shots and also what we are getting up to. Soft and sweet cinnamon apples combined with a crispy oat topping make this Oaty Apple Crumble a comforting and warming dessert that the whole family will love and it’s lighter than most desserts too! 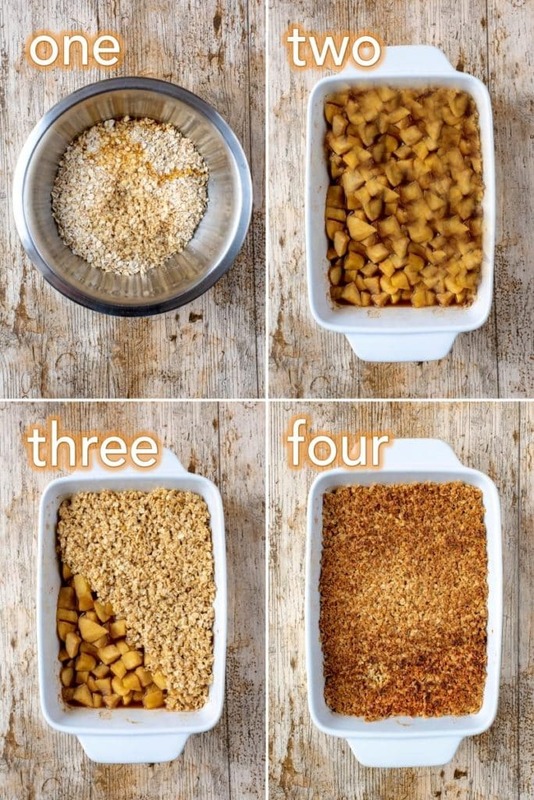 Mix together the oats, maple syrup and 2 tbsp of coconut oil. Add one tbsp of coconut oil to a pan and melt. Add the apples and gently cook for 5 minutes until softened. Put the sugar and cinnamon in the pan, stir and cook for a further 2 minutes. Put the cooked apples in a baking dish. Top with the oat mix. Put in a preheated oven at 200°C/400°F for 20 minutes. You can also make this in the microwave - head over to our Instagram Page to see how. Have you tried this recipe?Mention @hungryhealthyhappy on Instagram and tag #hungryhealthyhappy! DisclaimerThe nutritional information provided is approximate and is calculated using online tools. Information can vary depending on various factors, but we have endeavoured to be as accurate as possible. Aple crumble is the ultimate comfort food. One of my favourite desserts, this looks so tasty. This sounds so perfect! It really couldn’t be any easier to make. This recipe is so delicious and it’s so easy! Love it! I love a hearty pudding in the winter months, and apple crumble is such a classic favourite. This is a great recipe with the added oats, for a lovely and different consistancy. I’ve got the ingredients on hand and can’t wait to try this tomorrow morning! Yum! Thanks for sharing this recipe! I have a massive sweet tooth and am no good at making healthy autumn/winter dessert options. Great option. 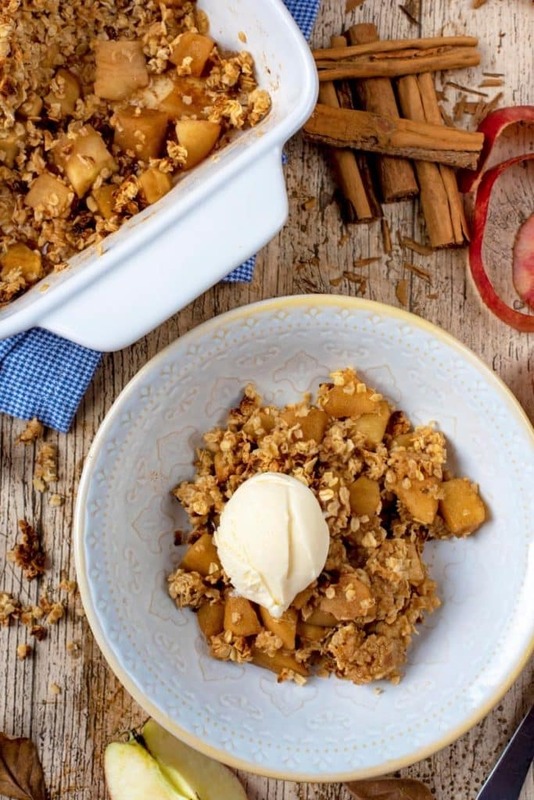 Apple crumble is a fave at this time of year – I LOVE oath apple crumble too! Yum. Apple crumble is one of my fave things this time of the year. This is a great recipe. Very healthy ingredients. It looks delicious and simple too. Will give it a try. Thanks for sharing. Hungry Healthy Happy is one of the UK’s most popular food and lifestyle blogs. Here you will find easy healthy recipes that show how healthy eating doesn’t have to be boring; home and garden projects, wellbeing, family life, travel and general happiness. 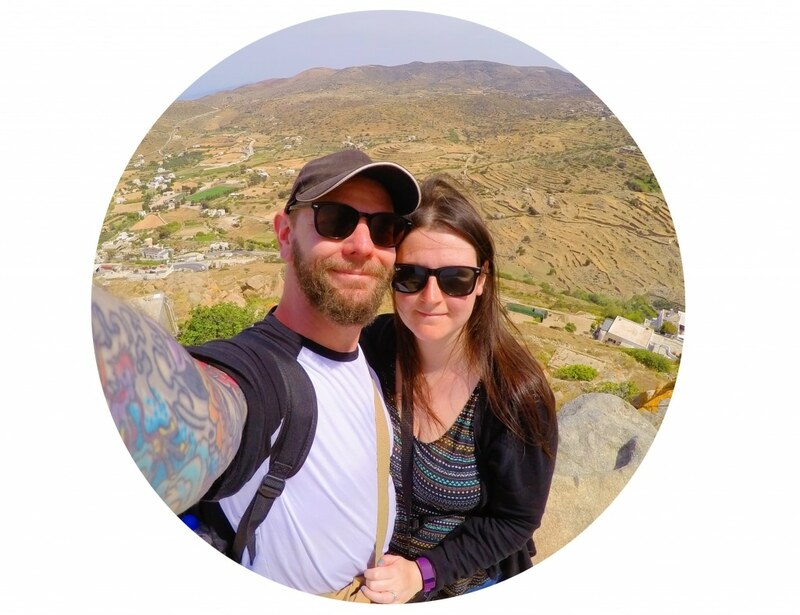 Dannii and Dave (and baby Avery) enjoy avocados, hiking, feta cheese and laughter.